My Places allows you to set up shortcut locations to quickly import, export, or share your captures to a cloud storage destination. Access your files from any computer or device. 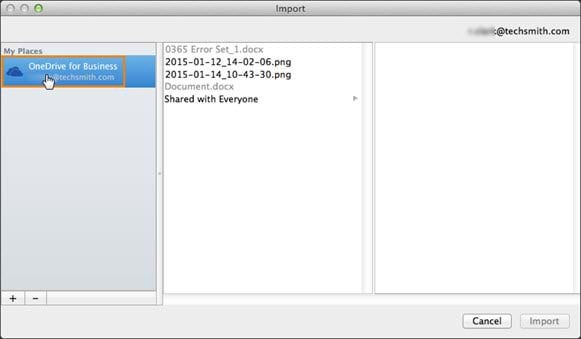 Share files with your coworkers for collaboration. Send a link to quickly communicate or to get feedback from others. Note: OneDrive for Business accounts are different from OneDrive accounts. OneDrive accounts are intended for personal storage separate from your workplace. OneDrive accounts are not supported at this time. Share files with everyone in your organization by placing it in the Share with Everyone folder. Share files with specific co-workers by name or by email. Set who can view or edit the files. Share with others outside of your organization depending on your company’s privacy settings. File > Import From My Places > Add button. Share > My Places > Add a Place. The shortcut location is added to My Places. Whether you are working from a different computer or device or need to collaborate with a coworker, you can quickly import images or videos from OneDrive for Business into Camtasia. In Camtasia, select File > Import From My Places. Select a location from My Places. If you do not have any locations in My Places or to import from a new location, see Add a Place. Browse to select the file to import. The file opens in the media bin. Select Share > My Places > OneDrive for Business. If you have not previously shared to My Places, see Add a Place. Drag the slider to adjust the video quality and file size. Click the Browse button to select a location for the video. A MP4 video file is uploaded to the selected My Places location. The URL is copied onto the clipboard.